"This overhaul makes Cleveland younger, more energetic, and may convince LeBron to stay next year. 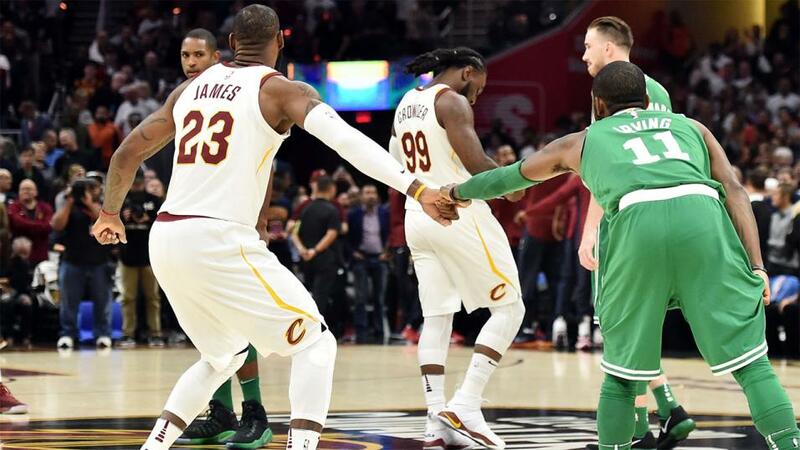 It helps them defensively, where they could not get much worse, and increases their threat from outside, as Hood is a good long-range shooter, and Hill leads the league in three-point percentage"
With LeBron's contract expiring this summer, and Cleveland on a dire run since Christmas, it was no surprise to see their roster revamped this week. Isaiah Thomas moved to the Lakers after to failing to fit in Ohio, Larry Nance and guard Jordan Clarkson coming the other way. George Hill switched to the Kings, with Sacramento taking Iman Shumpert, and Jae Crowder was shipped to Utah for Rodney Hood. Derrick Rose was also jettisoned, while Dwayne Wade's talents are now back in South Beach. This overhaul makes Cleveland younger, more energetic, and may convince LeBron to stay next year. It helps them defensively, where they could not get much worse, and increases their threat from outside, as Hood is a good long-range shooter, and Hill leads the league in three-point percentage. The new additions hadn't been cleared for Friday's win in Atlanta, so there should be some debuts this Sunday at Boston. Three days after overhauling your roster, TD Garden is not an ideal destination. While injuries and suspensions have slowed Boston's early-season momentum - a loss at Indiana and a 20 point humbling in Toronto this week underlining their dip in form - they still allow the fewest points in the league at home. Cleveland are 15-37-1 against the spread this season, by some distance the worst record in the league. The turnover on their roster is an unquantifiable here, but I would expect the Celtics defensive strength to come through against a team with so many changes. Boston -4.5 on the Handicap market at [1.89] looks solid in this spot. Before Cleveland's new team takes the court, Toronto go to Charlotte in an early Sunday meeting. Hornets fans will be relieved at the passing of the deadline with Kemba Walker still on their roster. Walker leads the team with 23 points, 5.8 assists, and 31 minutes per game, and will make his second All-Star bow as Porzingis' replacement on team Team LeBron next week. Trade rumours swirled last week, but he remains the Hornet's star player. Funneling so much through Walker makes the Hornets predictable when games are on the line. It's over a year since they won a one-possession game, and they rank 26th in the league in fourth quarter scoring. They need other players to show in the clutch if they're to make a postseason run. They are unlikely to kick-start their season against Toronto, who are one of the form teams in the league having won nine of their last twelve games. Their demolition of Boston this week suggests they could challenge for the Eastern Conference crown come playoff time. Toronto rank third in the league in scoring per game on the road, and there's little reason to expect Charlotte to hold them up. I would take Toronto -3 on the Handicap market at [1.89]. Later, Minnesota host the Kings, their epic overtime encounter with LeBron still fresh in the memory. James finished the game with 37 points, 15 assists and 10 rebounds, and scored a game-winning buzzer-beater. The T'wolves shouldn't be too disheartened. Jimmy Butler had 35 points, Karl-Anthony Towns grabbed 30, and, but for the magisterial cool of James' fade-away jumper, they'd have had double-overtime and possibly taken a significant road victory. They followed it up with another close road loss at the Bulls, but they're on a twelve game home winning streak. They should make it thirteen versus Sacramento. The Kings are another team dealing with deadline fallout. George Hill had not brought the defensive solidity they'd expected, but they'll miss his shooting and experience on a rebuilding team. De'Aaron Fox's development at point-guard will be foregrounded now. Shumpert will likely stick around for the next few years, though Joe Johnson has already secured a buy-out and signed for the Rockets. This all shows Sacramento is a team with it's eyes on next season. Their trade moves will allow flexibility in free-agency and beyond. Minnesota can take advantage of this disruption, and will want to get back on track following the Cleveland and Chicago losses. I'd expect them to put up points on a Kings team in transition. Back Over 212.5 on the Total Points market at [1.98].